This is our second visit to the Merseyside Transport Trust’s annual Running Day. As last year, the day was a fantastic success and we have tried to capture the atmosphere and excitement of the day for you to enjoy. The programme starts at Liverpool Pier Head, the once busy terminus, that goes back as far as the trams. The vehicles were filmed arriving and taking up their duties for the day. As last year all the services serve the Penny Lane terminus and go through Woolton and the Liverpool South Parkway bus & rail interchange. As a change for this year, some special services were introduced away from the main routes. These used two recently restored single deckers, Leyland Panther 1054 and Bristol RE 2025 – you can sample both these superb vehicles on this programme! Our first journey of the day is onboard L501 (501 KD) in Liverpool Corporation livery. 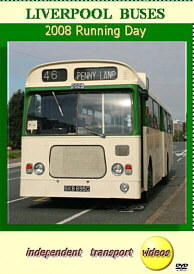 This is one of Liverpool’s first Leyland Atlanteans and takes us on the journey to Penny Lane. Here we change to 2025 (SKB 695G) a very rare Bristol RELL6G with Park Royal bodywork and head out to Walton via Everton, and then back to Penny Lane. It is interesting to hear the familiar sound of the RE, but in the strange surroundings of a Park Royal body! We then join L501 again and travel back to Pier Head on service 5. After recording some more departures, we board Leyland Atlantean 1236 (BKC 236K) smartly turned out in MPTE livery for the journey to Woolton via Penny Lane. 1236 then becomes a 66B for our ride to Liverpool South Parkway. After a review here we travel on Leyland Panther 1054 (FKF 933G) to Penny Lane going via Woolton and Childwall. We return to Liverpool South Parkway for the final time on 1836 (TVM 220V) an AN68 Atlantean with East Lancs bodywork. 1836 is also our bus for the run down to Pier Head, but we stop off on the way at Woolton and Penny Lane to capture the action. independent transport videos would like to thank everyone involved in organising this excellent event. Now you can all relive the day!